Remedy Bladder Infection | Product Catalog - FOH Inc. Please tell us what you like most about any of our UTI Products from your own experiences using them. At the beginning of every month we will pick our favourite entry as the winner and publish it on this site. In appreciation for your time, you will receive a free bottle of Uribiotic. 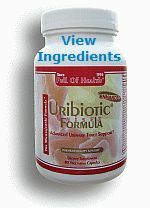 As an advanced unisex urinary tract support, our proprietary Uribiotic Formula has been effective in helping to overcome cystitis (inflammation of the urinary bladder), urethritis (inflammation of the urethra), and urethral syndrome (due to a low grade infection of the Skene's glands on the sides and bottom of the urethra). PLEASE NOTE: Although Uribiotic Formula can be successfully taken as a stand-alone, for optimal results - especially, when urine culture results are available - it may also be used in combination with d-Mannose MAX Powder (if E. coli bacteria are present), and/or UT Probiotics Ultra Strength (when antibiotics have been taken). Dietary supplement to support the immune and urinary trakct systems. Effective in preventing infectious E. coli bacteria from sticking to the inner walls of the bladder; complementary to Uribiotic Formula (a broad-spectrum herbal remedy) and/or UT Probiotics Ultra Strength (when antibiotics were taken). An ultra strength (52.5 Billion CFU) non-dairy probiotic supplement that supports urinary tract health. It helps fully exert the therapeutic, protective and preventive (prophylactic) effects of the Uribiotic Formula (a broad spectrum herbal remedy) and d-Mannose MAX Powder. A superb collection of over 260 simple and seriously delicious recipes (guaranteed! ); a must for those who are serious about fighting both acute and repeated bladder infection through the dietary and lifestyle changes. A unique, clinically proven, standardized pollens blend for enlarged prostate (benign prostatic hyperplasia/BPH). Used with success by men for generations in Europe and backed by numerous studies. Equally effective in chronic prostate infection (prostatitis/CP), especially when taken along with Uribiotic Formula and/or UT Probiotics Ultra Strength (when antibiotics were taken). © 2003-2018 Remedy-Bladder-Infection.com. Stop Urinary Bladder Infection Naturally | Uribiotic Formula. UTI Natural Cure, Treatment & Prevention. Antibiotic-free solution to urinary tract Infection, cystitis, urethritis, and urethral syndrome. The information provided herein is a general overview only and may not apply to everyone; therefore, it should not be used for diagnosis or treatment of any medical condition. While reasonable effort has been made to ensure the accuracy of the information, Full of Health, Inc. assumes no responsibility for errors or omissions, or for damages resulting from use of the UTI information herein. About Full of Health, Inc.